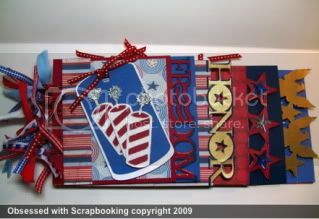 Obsessed with Scrapbooking: Happy 4th of July card and mini album! Happy 4th of July card and mini album! Here is a card (and envelope) made using the Stand and Salute Cricut cartridge! This is a fantastic cartridge to use for those 4th of July and military cards/layouts/projects. I cut the "USA" at 1-1/4" and shadowed it. Then, I just placed that on top of some Core'dinations cardstock I had run through the Cuttlebug with the Stars folder (love that thing!). A quick little border and ribbon and you're done. Here is my matching envelope for the card. 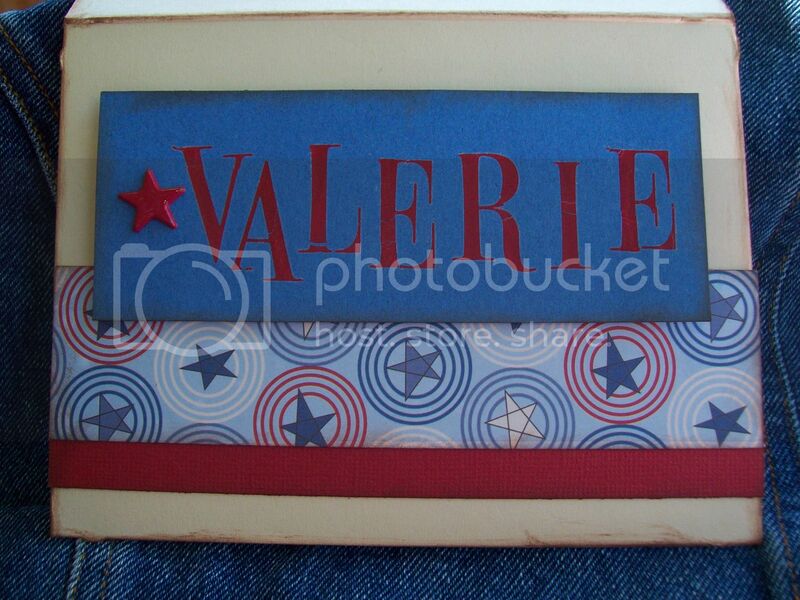 This card was given to my friend Valerie, who just got her U.S. citizenship - I thought she needed a USA card for the occasion. Letters on the envelope are sticker letters. I made this last year (but never posted it) - thus the sticker letters and not Cricut letters. Ha ha! I gave Valerie this mini album I made for the occasion so she could put her photos in it commemorating both she and her husband becoming US citizens. More about the album HERE, including a cut file for your Cricut Design Studio software, so you can cut this out also! Have a wonderful 4th of July! We're going to see fireworks and a soccer game tomorrow - along with swimming and bar-be-queing, so it should be fun! What are you doing? This mini album would be perfect to make with a group of students. Although we are not in school in July, I could use the same theme for the American Revolution. Thanks and enjoy the holiday weekend. Cool card and amazing album! How sweet of you to make these things for your friend and her DH--and congrats to her on becoming a US citizen! That little album is delightful! Both are so cute. I'm sure your friend was thrilled with her gifts. Both way too cute. Love the embossed stars on the card. What a nice a gift! The embossing is a nice touch. I love the mini albums with all that ribbon. Very cute! On my, the album is so special! What a wonderful gift and especially to remember something as special as becoming a citizen. The card to go with it just tops the whole thing off. I hope all is well with you and yours and you are having a blessed 4th. Great cards and I LOVE the mini-album. Great work as usual! TFS - Happy Holidays! What a wonderful card and album, bet your friend loved it. I absolutely love this little book! Thank you for sharing it with us! Have a great 4th of July! very cute! I'm working Independence Day (i refuse to call it the 4th of July) and I will be giving God all the Glory for the blessing of being born in this country. I'm thrilled to be working/have a job so I won't whinge and moan over it! ?Wow! You have been busy! Great stuff! It reminds me that I need to mail those 4th of July cards today! I'm already late. This is a great album...need to pull out my gypsy and re-create one for myself! Thanks and have a Happy 4th of July!! Great mini album sand card. The album is wonderful. Love the mini album! We are having friends over and watching the fireworks from our pool. Great view! What a very good friend you are! That album is super cute and I love love the card! That is such an awesome idea! I absolutely love how thoughtful it is, not to mention it is absolutely gorgeous! Great Job! That star cuttlebug folder is so cool! Want it. Pretty card. Happy weekend. Such great projects. So festive. Happy 4th of July. TFS. Great card and mini! What a great thing to celebrate too. I think that people forget that there are folks from other countries who do the right thing and become citizens legally. Thanks. Joy that album is perfect. I have a nephew that just left for Afganastan (sp?) and it would be cool to send this to his new wife to put pics of him in. Thank you so much for sharing the cut file. I love how well everything goes together! These are some of my fav projects to date! If you're interested, there's a new card challenge here. this album is amazing. I love it. Love the album...great card...thanks for sharing. love them both, too cute. I'm going to have to get the star folder you used with your cuttlebug, I don't have that one. That mini album is a really thoughtful gift. Very Nice! Congratulations to your friend, Valerie, and her husband. What wonderful memories she'll have when looking at your very cool creations!! Have fun this weekend, Joy! we are having friends over for a cookout! Lovely card and mini album!!! TFS!!! These are just too awesome!!!! Great work! What a wonderful book--so much fun to make and look at. What a warm thought for your friend and God bless her for being becoming a U.S. Citizen. Very nice card. What did we do before the C's ~ Cricut and Cuddlebug!! What a wonderful post for this special weekend and what a very thoughtful gift. I love them both. The core'dinations paper looks terrific with the star embossing. The mini album is a perfect gift for your friend. I'm sure she will love it! Happy 4th of July to you as well. We're staying home and BBQing and spending some quality time together. The card and mini album are so cute. Great designs. What a great gift for your friend...tfs! I absolutely love, love, love that mini album. I am thinking of incorporating it into one of my double page layouts for competition!!! I am sure she will love it Joy. The card is great. I love the mini album. I've always wanted to do one. Maybe I'll try that soon. I love the card! I think the album is awesome! Nice work! Thanks for the ideas. This is a really great mini album. Thanks for sharing. I love the mini album and the card is just sooo cute. I need to get ther stara cuttlebug folder. 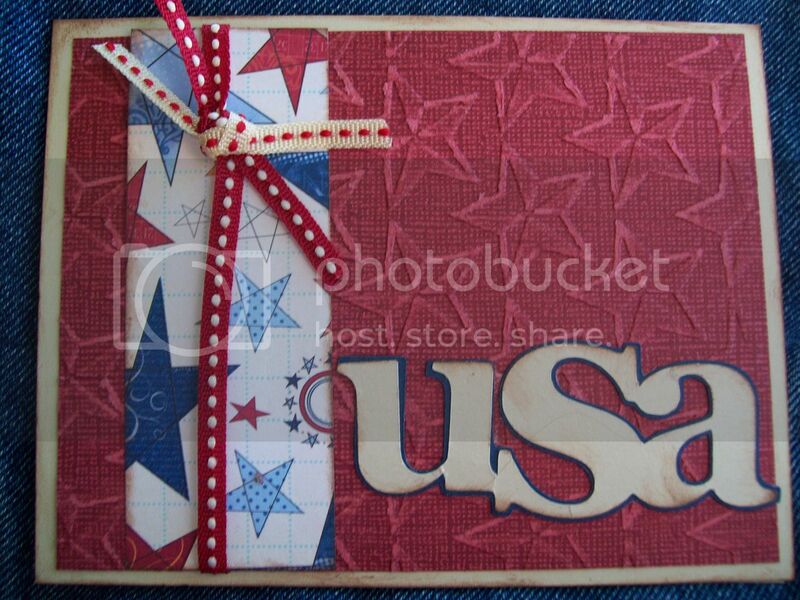 Great 4th of July cards, I love the star embossing folder in the background to I have got to get that one sometime. Love the card and album. July 4th is my 22nd wedding anniversary. Thank you for sharing them with us. Awesome! I might make one for my son too!! Your card and album are beautiful! I have Stand & Salute but haven't done much with it. Thanks for the inspiration! great cards. love them. Happy Fourth of July everyone! Love your card and the album! What a great gift for your friend! What a great gift for someone just becoming citizens! Wow, Joy! That mini is AWESOME! Love the mini album. New to circut; do you have to have the design studio in order to make this album? I have the stand & salute and would love to make this for my son who is in the military. Love this project! Thanks for sharing your talents. I actually have the Stand and Salute Cricut Cartridge and the Star Cuttlebug Embossing Folder; now all I need is the cute paper! I LOVE your mini album (I like these better than scrapbooks)! Love this gift set and how sweet of you to do this!!! Congrats on your friends becoming US citizens!!!! Thanks for sharing another wonderful project!!!! love both your projects, I've had a hard time finding 4th of July type paper this year. Love the album! I always think of them as square or a word. Love how each page is something different! What a wonderful gift! Beautiful job as always! What a nice gift for new US citizens. The card and mini album are beautiful. Love this patriotic word book, so creative and very inspiring!